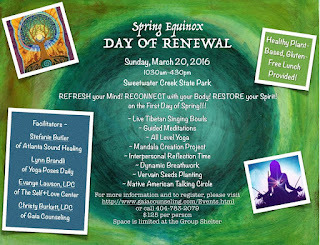 Spring Equinox marks a time of transition and new beginnings. It is a natural time for renewal, release and exploration. 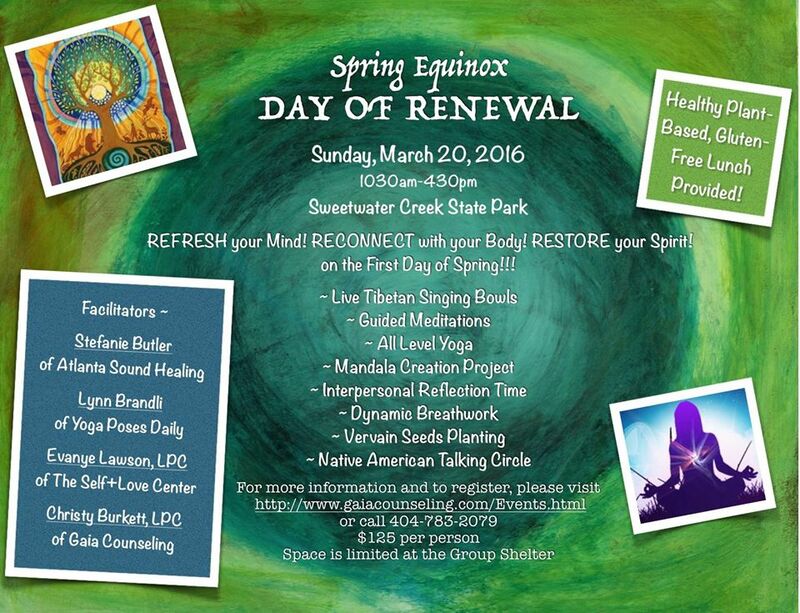 Join us for a SPA day for your MIND/BODY/SPIRIT! Our offerings include yoga, breathwork, guided meditations with the singing bowls, trance dancing and mandala creation. The day is from 10:30 - 4:30 at beautiful Sweetwater Creek and includes lunch and parking. The cost for the day is $125. The bowls have the ability to lower your brainwaves to an alpha or theta brainwave state. In these lower brainwave states, you are able to access a meditative, peaceful state of mind which has a powerful healing effect on your body, mind, emotions and spirit. Mandala creation - represents wholeness, a cosmic diagram reminding us of our relation to infinity, extending beyond and within our bodies and minds. ​This is a non-verbal healing technique that is designed to help remove distressing emotions out of the body. People often feel more relaxed after one session, have increased focus, more clarity in their life purpose, more confident, and able to handle stressful situations with ease. Certified Iyengar Yoga is alignment-based, called "meditation in action" and safe for all ages and body types.